For whatever reasons—investment banks, hedge funds, corrupt politicians, permanent war, the beatification of greed—most of the world is in an economic tailspin. For working artists, perhaps the most vulnerable species in the food chain, this has led to an almost total cessation of sales. Is this the end of their (your) world? Sometimes it feels that way. What to do? I confess I’m not sure what you should do but I trust you’ll bear with me while I make a few observations and suggestions from my own experience. 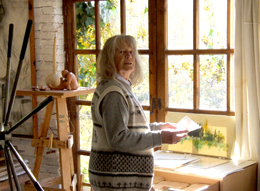 I’ve lived nearly four decades from selling my paintings and prints. In the past few years, however, those sales have almost dried up. Even so, I’m still surviving from my work. Let me tell you about it. You might get some helpful ideas and some encouragement. There are a few requirements for this survival-in-a-crisis project: a positive mind set, the determination to keep on keepin’ on, and a measure of realistic optimism. A few years ago I read in a Spanish newspaper a statistical report about the employment success of different categories of Spanish graduates. There was one group that got jobs sooner that the rest. Engineers? They are always in demand. IT specialists? We know how important they are in keeping the world spinning. Mathematicians? They invented the credit default swap. The correct answer: none of the above. The graduates who got the first jobs straight out of university were the fine-art majors. Why? The article concluded that it was because they were creative and job hunting requires creativity. Reading that article made my day and I have never forgotten it. It struck me then, like a candy-striped bolt of lucidity, that creativity is not just about putting paint on canvas or scratching lines on a plate. Even more important—though those things are important—it’s about molding every possible aspect of your existence, about creating a life of your own. Creativity is not only our joy. It’s our competitive advantage. Parachute ten people into deepest Amazonia. Which one will survive? The weight lifter? No. The artist. So count your blessings every morning. It is hard to put one’s finger on what constitutes creativity and how to get there. Scientific attempts to do so have mainly served to muddy the waters. They don’t shed much light on the kind of creativity we’re talking about here, neither in art nor in life. I think creativity springs from quite a few different sources and influences. The first prerequisite, I think, is freedom of thought and action, not only physical freedom but mental as well. It’s hard to be creative if you’ve been hard wired as a child to a set of social or religious dogmas. It’s equally hard if the society you live in offers a lot of flashy distractions. I think most creative solutions come from people who have grown up in settings that encourage critical thinking and develop sets of personal criteria regarding all of life’s issues, large and small. If you’re strapped to conventionalisms from the outset you’re probably not going to be very creative in any way. Some creativity is both inherited and nurtured. My own family has painters and good cooks. My fondest childhood memories are of visits to my paternal grandmother’s house. It was full of original artwork, and my grandmother would always bring out a big box of papers and colored pencils. Though, now that I’m a grandmother myself I suspect those art supplies were also intended to keep me occupied and out of trouble. Certainly curiosity is important. And vital energy. You’ve got to be self driven to want to do things. The Spanish have a nice term for this. They call it “inquietud,” “unquietness,” something akin to mental and creative “ants in your pants,” which won’t let you rest . I also think a certain degree of intelligence is necessary, though not necessarily sound mental health. The mentally disturbed can be remarkably creative. The best examples of this phenomenon that I have seen were in the Musee de Art Brut, a remarkable collection of psychotic art in Lausanne, Switzerland. This is their website: http://www.artbrut.ch. Though the site itself is a model of Swiss uncreativity, the visual content is wonderful.